I decided to make something real quick for myself while the princess napped today (which by the way, is a very short time now a days). 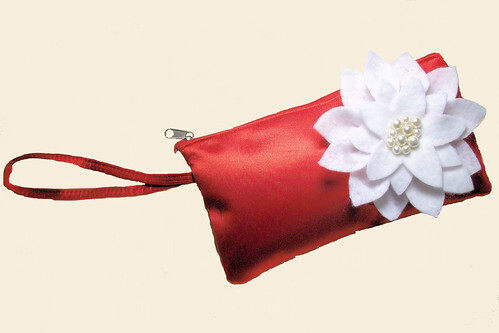 I had bought this little wristlet after Christmas at Target for 25 cents with the thought of embellishing it somehow. I then came across this pattern (click on the free patterns option and the choices will come up. It’s under the holiday pattens) by Amy Butler. I decided to use the template, but of course I didn’t make the flower that big or it wouldn’t fit. Then I added some vintage pearl like beads I had to the center of the flower. I used fabric glue to glue it onto the purse. What goes with purse hooks?